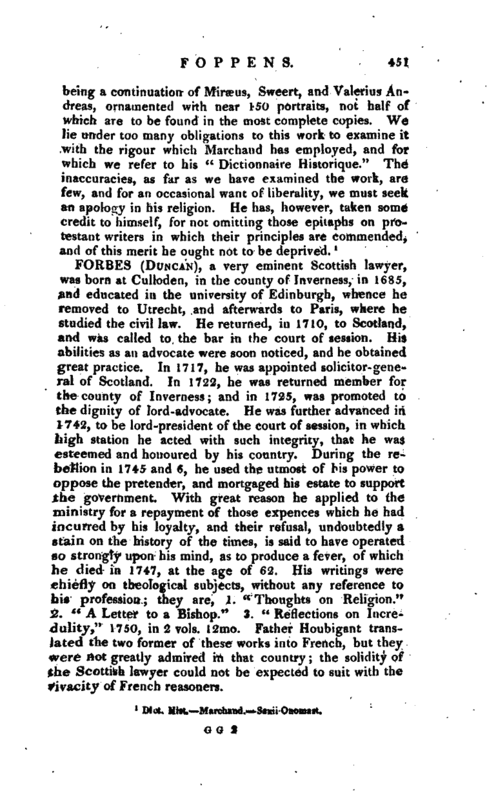 , a very eminent Scottish lawyer, was born at Culloden, in the county of Inverness, in 1685, and educated in the university of Edinburgh, whence he removed to Utrecht, and afterwards to Paris, where he studied the civil law. He returned, in 1710, to Scotland, and was called to the bar in the court of session. His abilities as an advocate were soon noticed, and he obtained great practice. In 1717, he was appointed solicitor-general of Scotland. In 1722, he was returned member for the county of Inverness; and in 1725, was promoted to the dignity of lord-advocate. He was further advanced in 1742, to be lord-president of the court of session, in which high station he acted with such integrity, that he was esteemed and honoured by his country. During the rebellion in 1745 and 6, he used the utmost of his power to oppose the pretender, and mortgaged his estate to support the government. With great reason he applied to the ministry for a repayment of those expences which he had incurred by his loyalty, and their refusal, undoubtedly a stain on the history of the times, is said to have operated so strongly upon his mind, as to produce a fever, of which he died in 1747, at the age of 62. His writings were chiefly on theological subjects, without any reference to his profession; they are, 1. “Thoughts on Religion.” 2. “A Letter to a Bishop.” 3. “Reflections on Incredulity,” 1750, in 2 vols. 12mo. Father Houbigant translated the two former of these works into French, but they were not greatly admired in that country; the solidity of the Scottish lawyer could not be expected to suit with the vivacity of French reasoners. | Duncan Forbes of Culloden, says a recent biographer, was in all respects one of the most eminent men of his time. 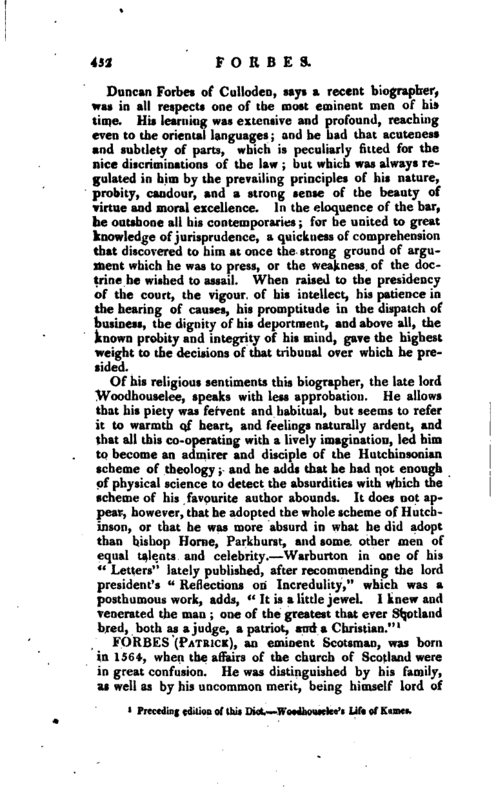 His learning was extensive and profound, reaching even to the oriental languages; and he had that acuteness and subtlety of parts, which is peculiarly fitted for the nice discriminations of the law; but which was always regulated in him by the prevailing principles of his nature, probity, candour, and a strong sense of the beauty of virtue and moral excellence. In the eloquence of the bar, he outshone all his contemporaries; for he united to great knowledge of jurisprudence, a quickness of comprehension that discovered to him at once the strong ground of argument which he was to press, or the weakness of the doctrine he wished to assail. When raised to the presidency of the court, the vigour of his intellect, his patience in the hearing of causes, his promptitude in the dispatch of business, the dignity, of his deportment, and above all, the known probity and integrity of his mind, gave the highest weight to the decisions of that tribunal over which he presided. Preceding edition of this Dict. Wood heuselee’s Life of Kamee.